“Thanks for infusing new life into my very regular meditation routine. For a review of the ColorTrack four glasses, please click here. Specialty glasses are not items we make in advance and keep in stock, they are built per order. Please allow few days or up to a week time for delivery. We will inform you if we foresee longer delays. Important Note – Polarities: We make both kinds of polarities because we offer color glasses choices to all users of Light and Sound Relaxation stimulation device users, not just our models. The polarity of the glasses you need is not determined by the glasses, it is determined by the polarity of the device they will be used with. Although we like helping out and sending everyone quality glasses to replace the old and worn out ones, please keep in mind that some of the devices by other manufacturers do not have the battery power to run PHOTOSONIX glasses. 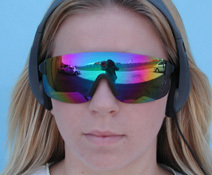 Or even the software to do so, especially with the PHOTOSONIX ColorTrack4 glasses.